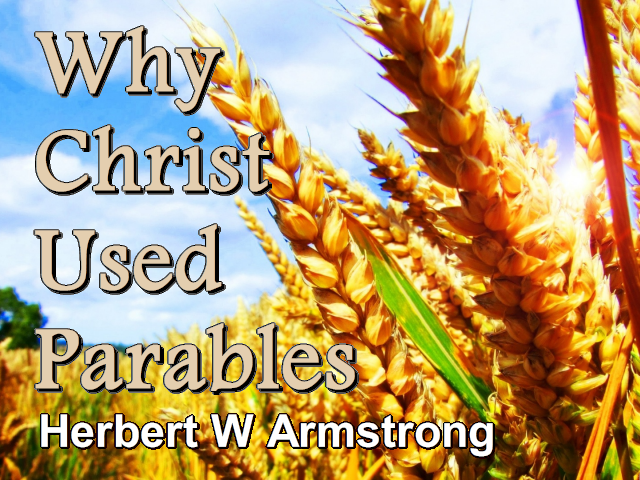 My friends, why is it that Jesus spoke in parables so that the people could not understand? Now, we've always supposed, of course, most people have, that the reason that Jesus Christ spoke in parables was to make the meaning more clear — to sort of illustrate it so people would understand better. But we've been seeing that He did exactly the opposite — but why? Why did He not want those people to understand? And now, in Matthew the thirteenth chapter and the tenth verse after Jesus had spoken the Parable of the Sower and the Seed the people didn't understand it and the disciples didn't understand it. And so the disciples came, they came privately to Jesus and they said to Him, "Why speakest thou unto them in parables?" And they asked Him to explain, they couldn't understand and they said why do you speak in parables? Now, notice if He said to make the meaning clear so that they'll understand it better. He didn't say that. He said, "...he answered and said unto them, Unto you [His disciples], whom he had called [Remember. Remember that He had called them. They had not called Him. ]...Unto you it is given to know the mysteries of the kingdom of Heaven." And of course Mark and Luke and John always use the expression rather "the kingdom of God" when they report the same identical word. Now, here this same thing is reported in Mark the fourth chapter and I'll read it in a minute in the eleventh verse where it is "kingdom of God." And it also occurs in Luke the eighth chapter and the tenth verse where He said to "know the mysteries of the kingdom of God." It isn't a Kingdom in Heaven, it's God's Kingdom that is owned by God and ruled by God from Heaven. It's ruled from Heaven. It belongs to Heaven. It is ruled by Heaven because the ruler is on His Throne up in Heaven. So, "he answered and said, Unto you it is given to know the mysteries of the kingdom of Heaven but to them it is not given." Now, notice. He spoke in parables because to them it is not given. "...therefore speak I to them in parables because seeing they see not and hearing they hear not, neither do they understand." Now, let's get back to Mark's account of this thing very quickly. In the fourth chapter of Mark where He said unto them, His disciples, "Unto you is given the mystery of the kingdom of God, but unto them that are without all things are done in parables [why?] that seeing they may see and not perceive and hearing they may hear and not understand lest, now notice, lest haply they should turn again and it should be forgiven them." Now, let's read that in the King James because I was just reading that in the American Revised Version and I would like to read that to you now in the Authorized or the King James translation which is the version of the Bible that nearly everybody uses: "that seeing He said they may see and not perceive and hearing they may hear and not understand lest at any time they should be converted and their sins should be forgiven them." He spoke in parables so they could not understand lest they should understand and be converted and their sins be forgiven. So, in order that their sins would not be forgiven them, in order that they could not understand and could not be converted, Jesus Christ spoke in parables. Now, why? Why would He have done that? My friends, if I tell you that you that this not the only time in which God is trying to save this world, I know that a lot of people will rise up in the most angry indignation. They'll almost lose their tempers about it because we have been taught that this is the only time in which any one can ever be saved and pretty soon it's going to be too late, haven't we? How many times have you heard people say, "There is no middle ground they will tell you. Either this very second you are a saved soul or a lost sinner. There is no middle ground." But, my friends, they don't know what they're talking about. Did Jesus say that? If so then He was condemning these people to be lost and Jesus Christ could not do that. Now, He spoke to them in a language they couldn't understand, "lest they might be converted." Did that mean then He didn't want them to be converted? Was He consigning them to destruction in hellfire? You know the Bible does teach destruction in hellfire. Is that what He was consigning them to? You know that Jesus Christ couldn't do that and neither did He. And now, let's use another little bit of reason. Just, my friends, as you have thought that Jesus spoke in parables to make the meaning more clear, and I have just read you here in Jesus' own words where He said that "unto you is given the mystery of the kingdom of God but unto them that are without [They weren't within the fold. They were without. They hadn't been called.] all things are done in parables that seeing they may see and not perceive and hearing they may hear and not understand, lest at any time they should be converted and their sins should be forgiven them. He said "Unto you it is given to know the mysteries of this kingdom of God but unto them it is not given and therefore I speak to them in parables so they can't understand." Now, those are the words of Jesus. You haven't believed that but that's what Jesus said and that's His word. That's not my word. I'm just reading it to you. I'm not the author of those words. God Almighty is as He gave it to Jesus Christ and as Jesus Christ said those words and spoke them and as Mark and Matthew and Luke recorded them faithfully as they were inspired and wrote them down. Now, my friends, just as you had that all mixed up and all wrong and haven't believed the Truth so have you also had it all mixed up that this is the only time that anyone can ever be saved. Now, I tell you that's the best news that ever happened, because just look a minute and I want you to reason. Look at this United States. Here's the most wonderful nation on earth. Here, I think there are perhaps more Bibles in this nation, of course there are, than other nation anywhere, nevertheless, what percentage of people even by the world's standard of what constitutes being saved which is certainly not God's standard let me tell you that, but even by the world's standard, why they think that well, if you just profess Christ, if you just receive Christ or accept Christ, you're getting just like receiving or accepting a Christmas present that you're saved automatically and you're already born again which you're not but which most people think you are and even if that were true still, what percentage would you say are saved as people call it? Of course, that shows they don't understand or they wouldn't use that language but what percentage have been converted or are really Christians or saved as people believe and what percentage are not? Do you know the biggest proportion of the people in the United States are not. Is that the way God intended it? Now, let's look a little further. You go over into other nations, China and Japan and India and the people are more thickly populated over there than any place on earth. Well, I wonder if you realize that there are more people in China than any other nation on earth. Now, that's where the biggest portion of the population of this world really live. About half of all the population of the earth live in China and Japan and India and then if you will add Burma and Indo-China and the sections down through there, which are just the same, they have what we call heathen religions. Of course, I think they would think our religion is heathen because they don't know anything about it. But there is half of all the people that live on the face of the earth. And most of those people have never so much as heard the only name by which men can be saved. Now, I know people think right away automatically, "Well, I guess God saves them some other way." Well, is there then some other way beside through Jesus Christ? Do you know another way to get saved? Do you know another way to inherit eternal life? Now, listen, Jesus talked about inheriting eternal life. If you inherit something you didn't have it before you inherited it. If you inherit a particular million dollars from a particular millionaire whose son you might be. Of course, I know you're probably not but I mean if you were you never had that million dollars until you inherited it. So, what you are an heir to inherit you do not yet have. And we are heirs to inherit salvation and we are to inherit it and eternal life and Jesus said we can inherit eternal life therefore you do not now have eternal life or you couldn't inherit it if you already had it. Now, is there some other way to inherit eternal life except by keeping the Commandments of God and having the faith of Jesus Christ and coming to God through Jesus Christ for the very faith that will do it? Is there any other way? By grace are you saved through faith, there is no other name given among men under heaven whereby men may be saved. And that's in your Bible. Now, what are you going to do with the fact that there are hundreds and hundreds of millions and perhaps approximately one half of all the people on the face of this earth that have never heard the name of Jesus Christ? They have never even heard the only name by which they could inherit eternal life. Now, here's the thing, if this is the only time when people can be saved I want you to realize this, that in...in the past one hundred years there have been many millions many hundreds of millions of those people who have lived their life and died and they're dead and they never had a chance. They never heard the name of Christ. They never knew anything about salvation. And I want to tell you, my friends, if you think God has another way of saving them you better start blowing the dust off your Bible and studying it and reading it because the Bible says no such thing. And I think we better come out of some of these silly pipe dreams we've had of just supposing. We'd better begin to find out. There's a Judgment Day coming and we're all going to be judged by what's written in this Word, not what we suppose or how we imagine and how we think, "Well, I am too busy for that and mind's on something else and I guess it'll be alright and it'll be so and so." You'd better take time to find out. And I can tell you, my friends, that I understand this Bible pretty well. I wouldn't be preaching to so many of you if I didn't. And I can tell you this there is nothing in the Bible that gives you any other way by which any man, woman or child can ever inherit eternal life except by a repentance of sin which is a transgression of God's Law and a coming to God through Jesus Christ and inheriting eternal life and salvation from God through Jesus Christ. There is no other way. And it comes by grace and through faith and there is no other way. Now, people who have never heard that name, people who have never even heard the Gospel, people who have never known Jesus Christ or heard about God have no chance whatsoever of salvation and that is the truth of your Bible. Now, that simply means that there have been in the last five hundred years more than perhaps two billion people certainly way over a billion people in the last one hundred years that have lived and died on this earth in the last one hundred years who have never had any chance whatsoever of salvation. Now, if this then is the only time that God's has for saving people and it's soon going to be too late and poor God won't have any chance Himself to save them then, if that's what you believe, I want to tell you then that you are consigning billions of people actually billions who have lived on this earth to being absolutely lost and being burned up and destroyed in Gehenna Fire or hellfire and eternal punishment which is for eternity. I didn't say eternal punishing, I said eternal punishment exactly as the Bible says it. But that's what's going to happen unless God has a time for such people to come to know. Now, why did Jesus Christ deny these people any chance of being converted? Oh, yes, I know this isn't what you've been hearing. I know this is different but I've been telling you, my friends, you've heard a message about Christ. You've been told that you must just accept Christ, receive Christ, believe in Christ and that's all, that there are no works, there is no knowledge there is no understanding. And you have been told wrong and deceived. Now, Jesus Christ said that people can worship Him in vain because by their doctrines of men. They used traditions of men for doctrines and by those traditions of men they make the Word of God of no effect. Now, when Jesus Christ came preaching His Gospel, what He preached was this. He came preaching the Gospel of the Kingdom of God and the Kingdom of God is the Government of God. And that God is a Kingdom. The Kingdom of God is God or the Family of God. It's a Family grown so great, it is and is to become the greatest nation, the greatest kingdom on the face of the earth or that ever existed and God is a Kingdom if your mind can grasp it which it probably can't my friends. When? When will man's dreams become reality? What would it take for the Arabs and Israelis to lay down their arms? What would it take for Russia and China to become allies? What would it take for all nations to forge their armaments into farm tools? The whole Gospel of Jesus Christ is about a soon coming world Government that will bring world peace. For a full understanding of this message of hope, request your free copy of "What Do You Mean ... the Kingdom of God?" Read how mankind will learn to forge his swords into plowshares. Request What Do You Mean ... the Kingdom of God? But Jesus said He came preaching the Good News of the Government of God, of the Rule of God, the Family of God into which we may be born and you have to be born of the Spirit, born again, born into that Family. You've been born into the human family, but the Kingdom of God is the Family of God. And now you have to be born into the God Family and that's a different Family altogether. It's a Spirit Family. You can be begotten of the Spirit now and born later. Listen, Jesus came preaching that Gospel, "the Gospel of the kingdom of God and saying the time is fulfilled and the kingdom of God [not the Kingdom of man, not the rule of man or nations of kingdoms of men but the Kingdom of God] is at hand, repent ye and believe..." What? Did He say believe me? Now, elsewhere the scripture says you have to believe in Christ, that's true. But what did He say in this place? And you have to believe what He said here as well as to believe in Him. He said, "and believe the gospel." "Repent ye and believe the gospel." Now, again, Jesus final commission to His own disciples as He was sending them out as apostles. He said, "Go ye in all the world and preach the Gospel to every creature. He that believeth and is baptized..." What are they to believe? Why, that what is preached, the Gospel. You have to believe the Gospel, my friends, in order to be converted. Now, a lot of people don't know that Gospel because it has not been preached for over eighteen hundred years. What a sorry condition it is that the Gospel that Jesus Christ preached that God sent to mankind by Him, the Gospel of the glorious Kingdom of God. But that's the Gospel of peace on the earth. That's the Gospel of universal world peace and of happiness, of prosperity for all, plenty for everybody and of happiness and men learning the way to have peace and to enjoy life all over the earth and it's going to take place on this earth and Jesus brought the Good News of it. And it will take place when the divine intervention of God takes place and Jesus Christ comes again as the King of kings and the Lord of lords to establish that Kingdom on this earth. Oh, It's wonderful Good News, and that's the Good News you'll have to believe and that part of the Good News about how you can be born into that Kingdom that is the way of Salvation. And even the way of Salvation and even the meaning of what it means to be born again you have not been hearing preached, because it has not been preached. Men have not understood the Bible. You don't have to interpret the Bible, my friends, I'm not given you some new interpretation. I'm just telling you what it says in plain language. You know when a baby is born, it's born and a baby born of its parents is just like its parents. It'll grow up to be exactly like them. There are differences in each individual in appearance of course, little minor differences but in total it's just the same, it's a human being like they are. When it grows up it isn't going to be chicken or a cow or a bear or a snake or a bird, it's going to be a human being just like its parents. And when you're born of God you'll be like God is Divine and God is perfect and God has perfect character. God is Holy. And you'll have to be all of those things when you're born of God. We go around talking about when I was born again. Oh, how little we understand. God help us to open our eyes and to see what the Bible says in plain language. It explains or interprets itself. It doesn't need any interpretation of men. And that's exactly what's wrong, you've been hearing the interpretations of men and to humanly interpret the Bible is to twist its meaning all around to suit the human being, make it mean it something it didn't say or didn't mean at all, in the first place. Alright, now, we have been seeing here that this is not the only time of salvation and there was a reason why Jesus here did not let the people know what He was saying. Now, let's go a little further. Coming into the sixteenth verse, now, of Matthew thirteen. Up until the and including the fifteenth verse, He had been talking about these other people as Isaiah had prophesied that "hearing they would hear and not understand, seeing they shall see and in no wise perceive. For this people's heart is waxed gross, their ears are dull of hearing, their eyes they have closed; Lest haply they should perceive with their eyes, And hear with their ears, And understand with their heart, And should turn again, And I should heal them." That's quoted from Isaiah the sixth chapter, the ninth on and the tenth verses. Now, then Jesus continued and I want you to get this, "But," He said to His disciples, "blessed are your eyes, for they see; and your ears, for they hear. For verily..." Now, here He introduces a new thought. Listen. "For verily I say unto you, that many prophets and righteous men desired to see the things which you see, and they saw them not..." Now, He's going way back hundreds and hundreds of years before and hundreds of years before they lived He says there were prophets, they were men of God and they were used in the writing of the Holy Scriptures of the Old Testament. And those prophets were righteous men. He said "verily I say unto you, that many prophets and righteous men [righteous men] desired to see the things that you see, and they saw them not..." It was hidden from them. They couldn't see. The time had not yet come for that to happen. I want you to get that. "...and to hear the things which you hear, and they heard them not." Now, how could that be? Then He continued to say, no that's all of that, I...the next thought I'm going to come to later. Now, then my friends, let me give you a little of it. I'm going to show you something that one of these prophets wanted to hear and couldn't hear and that these disciples wanted to hear nineteen hundred years ago and even they could not understand but you and I today can understand. Now, knowledge was revealed by and through Jesus Christ nineteen hundred years ago that the prophets of twenty-five hundred years ago and three thousand years ago could not understand though they were righteous men and though they desired to hear, now why? Now, I say to you also, my friends, that in the same manner that those disciples of Jesus and the Apostle Paul and Peter desired to know things and they were holy men of God and they desired to know things that you and I can know today but they couldn't know them. But your ears can hear them and your minds can grasp them and understand if you will heed and if you will listen. Now, let me give you some evidence of that. Daniel says, "I heard, but I understood not." When he was listening to the archangel and writing what the archangel had shown him in this great prophecy. And I'm in the twelfth chapter of Daniel and the eighth verse. "I heard, but I understood not. And then said I, O my Lord, what shall be the end of these things?" In other words, what does this mean? I know you're giving me a prophecy of way down in the end of this world, in the end of the age. In other words, the twentieth century is turning out to be. But the angel said, "Go thy way, Daniel: for the words are closed up and sealed till the time of the end." Not sealed for all eternity but sealed for a duration — till the time of the end. My friends we've hit the time of the end in this twentieth century A.D. beginning with World War I, but we haven't come to the time of the end yet in the days when Peter was saying, I should say, when Jesus was saying to Peter and John and Philip and Andrew and to those men in the day the Apostle Paul lived we haven't come to the time of the end. Peter couldn't understand this prophecy. Paul couldn't understand this prophecy but I understand it and you can understand it if you will. Now, he said they're closed up until the time of the end and what'll happen then. The next verse says, "Many shall be purified, and made white, and tried; but the wicked will do wickedly: and none of the wicked shall understand [And they don't even now and they can't understand. ]; but the wise shall understand." Now, you'll have to turn to the Bible. The Bible explains the Bible. The Bible interprets the Bible. I'm not going to give Herbert W. Armstrong's interpretation. I'm giving you the Bible interpretation and in the one-hundredth and eleventh Psalm you'll find the "fear of the Eternal is the beginning of wisdom a good understanding have they that do his commandments" and "all thy commandments are righteousness" and it is the righteous that shall understand. Now, the world will not keep the Commandments of God, cannot understand these prophecies and they don't. They don't understand it. In the fourth verse, "But thou, O Daniel, shut up the words, and seal the book, even till the time of the end: many shall run to and fro [and we come to the time of the end and aren't we doing that today — backwards and forewards — running, not walking, running. Flying at break neck speed, flying faster than the wind — running to and fro], and knowledge shall be increased." There's never been such an influx of increased knowledge as we're having today and for unfortunately a great deal of it is false knowledge. My friends, the whole thing is this: a lot of things are revealed to us today that they couldn't see then. And the time is coming after Jesus comes again that a great many things will be revealed which we can't see today. Now, they had no salvation. It was denied and Jesus spoke in parables so they couldn't have their salvation then, there is a time coming. Now, that get's down to the meaning of this thing of predestination and you know it is taught in your Bible but no one seems to have understood it. Nobody, let me say this and repeat it again, nobody has ever been predestinated to be lost. You cannot find one place in the Bible where anyone was ever predestinated to be lost but men have been some of them predestinated to be called at this time to salvation because others are not called now but the world shall be called later. Now, the answer to that is the answer to this whole problem of why Jesus spoke in a language they couldn't understand. The answer to that and the subject of predestination is the answer to why some in China and Japan and India have never had a chance. Why don't you write in our free booklet on "Predestination" and that will explain the answer to all of these things I've brought up in this broadcast. Now, it's going to shock you. It's going to be different from anything you've heard and if you'll read this without prejudice and without getting offended at the Truth and if you will just get out your glasses if you need them or blow the dust off the Bible and begin to read it and compare it with the Bible you'll be surprised. Write for that booklet on "Predestination." It's free, there's no charge if you tell me the name of the station to which you're listening. And now finally, let me remind you if you want to really understand your Bible, if you're willing to set yourself to devote a half hour or more every day to Bible study, you may enroll now for the Ambassador College Bible Correspondence Course. We charge no tuition. So, goodbye, friends until tomorrow.